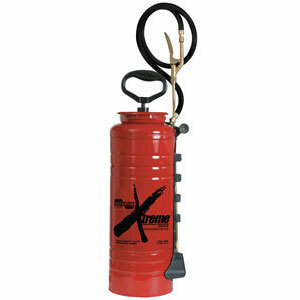 The Chapin Xtreme 3.5 Gallon Industrail Concrete Sprayer is a heavy-duty professional sprayer that is resistant to the most extreme chemicals including Acetone, Naphtha, Xylene and Toluene. It sprays up to 30-35% solids. The container is made of tri-poxy steel construction and features a wide mouth opening for easy filling, brass nozzle, 48 inch reinforced hose, VITON seals and gaskets for excellent chemical resistance, and a comfortable ergo pump handle. Can be used for curing, sealing, degreasers and more. • Includes .5 & 1.0 GPM nozzles.